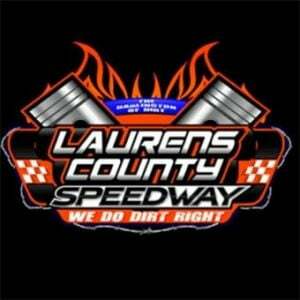 James Hudson won the main event of the Thunder Bomber Division at Laurens County Speedway Saturday night, but a last-lap crash stole the show. Daniel Overstreet, driving in the No. 28D car, appeared to cut off the No. 09 car of Terry Creasman in the fourth turn of the final lap, leaving Creasman to cut off the No. 12 car of Troy Bagwell. Overstreet was able to drive by without any difficulty, but the other two cars weren’t so fortunate. Creasman went into the outside wall coming out of turn four and then slid down to the inside wall, while Bagwell eventually saw his car end up on the outside wall coming out of turn four, spitting dirt from its tires while still on the wall. The red flag immediately went out to stop all activity on the track and allow emergency personnel on the track, but both Bagwell and Creasman appeared to be OK. The crash brought an end to a main event that saw five caution flags. Brandon Satterfield started on the pole for the main event but was knocked from contention after a caution on Lap 8. Hudson, who started on the outside of Row 1, moved into first place on Lap 9 and held the position the rest of the way, turning back defending track champion Casey Lawson to pick up the eventual victory. Casey Lawson finished second, Dan Lawson third, Don Hiott fourth and Dylan Chappell fifth. Limited: Michael Smith powered through the field to win the Limited Division. Tony Quarles was second and Dustin Sloan third. Tim Tollison started the race on the pole after the inversion draw flipped the entire order of the top four qualifiers – Quarles going from first to fourth, Smith from second to third, Sloan from third to second and Tollison from fourth to first. When the green flag flew, Smith made a quick charge to the front, with Quarles eventually taking second place. Smith stayed in first place from there to the finish, getting through a pair of cautions. The first, on Lap 8, allowed Quarles to get within a second after the restart before Smith pulled away. The second, six laps later, saw Smith quickly pull away and win by 3.838 seconds as he picked up a key victory to help boost his hopes of a track championship. SECA 604 Crate: Dale Timms won the main event by nearly 3.5 seconds over Terry Bullard, who took second place. Colby Cannon was third. The race had a pair of first-lap accidents that forced double-file restarts, but eventually the drivers were able to get through the rough start as Bullard moved to first and Brad Rachels took second. A few laps later Rachels was able to move ahead of Bullard for first place, but the race was brought to a halt when Rachels slammed the outside wall in turn two on the fourth lap of the race. The race was stopped, and EMS personnel came onto the track for Rachels, who initially complained of neck and back pain following a crash that broke his driver’s seat on impact. The injuries appeared not to be serious as Rachels later walked back onto the track and toward the pits. When the race finally resumed, Bullard held the lead, but Timms took the lead after going high in turns 3-4 at the end of the eighth lap, and when Bullard started to fall off the pace set by Timms, the race was essentially over. 602 Crate: Dustin Morris took the lead from the start of the main event and claimed a wire-to-wire victory. Colt Smith finished second and Lee Cooper third. Morris started the race on the pole, with Smith on the outside of Row 1, and the two quickly moved to first and second on the green flag. Morris quickly proved too fast for Smith, who started to lose some ground before a caution came out on Lap 5 to bunch the field back together. Morris was able to get out to a good restart after the caution and did so again on Lap 8 when the field was again bunched due to a yellow flag, and after the last caution, Morris was able to ease his way to the finish. 4-Cylinder: Rod Tucker has been the dominant driver at LCS this season, and that trend continued as Tucker won for the 14th time. Tucker beat Larry Teal, the defending point champion and current leader in the standings, by 4.875 seconds in the main event, with Scott Nelson finishing in third place. The race was a caution-free affair, with Tucker shooting out to a lead that quickly grew. As Tucker was cruising through the race, Summers and Teal were in an early battle for second that saw Teal eventually pull into the spot that he would not give up. FWD: Travis Jamieson knocked off Carson Crowder to win the main event, while Joel Cabe finished in third place. Jamieson started on the outside of Row 1 and got by on the outside in turn two to take the lead on the second attempted start. The lead held for Jamieson, who took a 2.667-second lead in the first four laps. The field had its chance after a pair of late cautions bunched everyone back together, but it was a small hurdle for Jamieson to clear as he eventually won by nearly 1.5 seconds. Enduro: Bruce Barnett grabbed the victory, with Clay Crowder finishing second and Eric Caughorn third. The last race of the night was littered with four cautions in the first four laps, three in turn four. Barnett took the lead from the outside of Row 1 at the start, with Caughorn following. Caughorn took the lead after Barnett and Crowder tangled. Barnett later got into the mix, getting the nose of his car into second place after passing Crowder. Barnett took the lead after contacting Caughorn and, after a late caution flag, pulled away as Caughorn appeared to have a right front flat tire that forced him to take third after Crowder got by for the position.